Typical methods for identifying hairs in forensic studies require destruction or chemical alteration of the specimens (e.g., embedding in chemical media, gold-coating, sectioning). For rare or isolated archaeological, paleontological, or museum hair specimens, methods that do not involve physical or chemical alterations are preferable. In this presentation, I will describe non-destructive methods for the identification of mammalian hair with examples from two case studies. In the first study, a single human hair was discovered among museum-curated megafaunal hair specimens from the Colorado Plateau dating to between about 10,400 and 13,600 cal BP. The hair may be intrusive. Alternatively, it may be one of the oldest traces of humans in North America, from a person who co-existed with a variety of extinct and locally extirpated megafauna such as mammoth, bison, horse, shrub-ox, and ground sloth. The second case study is a sample of probable human hairs identified among the large quantities of bison hair in the Promontory Caves, Utah (AD 1250-1290). Isotopic and genetic analyses of these human and animal hairs could provide significant insights into human prehistory, including megafaunal extinction processes, subsistence strategies, and Athapaskan migrations. 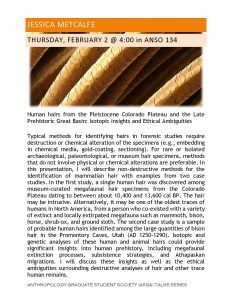 I will discuss these insights as well as the ethical ambiguities surrounding destructive analyses of hair and other trace human remains.